Coal production (weight: 10.33 per cent) increased by 6.4 per cent in September, 2018 over September, 2017. Its cumulative index increased by 9.6 per cent during April to September, 2018-19 over corresponding period of the previous year. Crude Oil production (weight: 8.98 per cent) declined by 4.2 per cent in September, 2018 over September, 2017. Its cumulative index declined by 3.4 per cent during April to September, 2018-19 over the corresponding period of previous year. The Natural Gas production (weight: 6.88 per cent) declined by 1.8 per cent in September, 2018 over September, 2017. Its cumulative index declined by 0.8 per cent during April to September, 2018-19 over the corresponding period of previous year. Petroleum Refinery production (weight: 28.04 per cent) increased by 2.5 per cent in September, 2018 over September, 2017. Its cumulative index increased by 6.6 per cent during April to September, 2018-19 over the corresponding period of previous year. 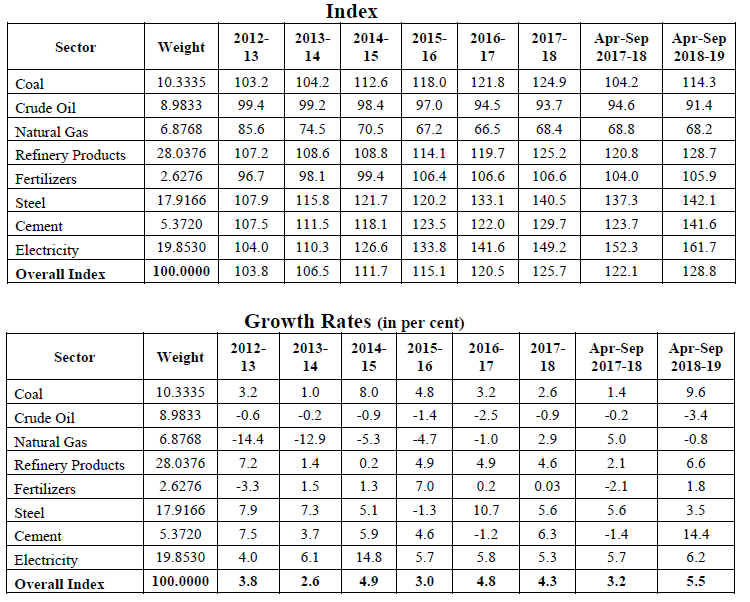 Fertilizers production (weight: 2.63 per cent) increased by 2.5 per cent in September, 2018 over September, 2017. Its cumulative index increased by 1.8 per cent during April to September, 2018-19 over the corresponding period of previous year. Steel production (weight: 17.92 per cent) increased by 3.2 per cent in September, 2018 over September, 2017. Its cumulative index increased by 3.5 per cent during April to September, 2018-19 over the corresponding period of previous year. Cement production (weight: 5.37 per cent) increased by 11.8 per cent in September, 2018 over September, 2017. 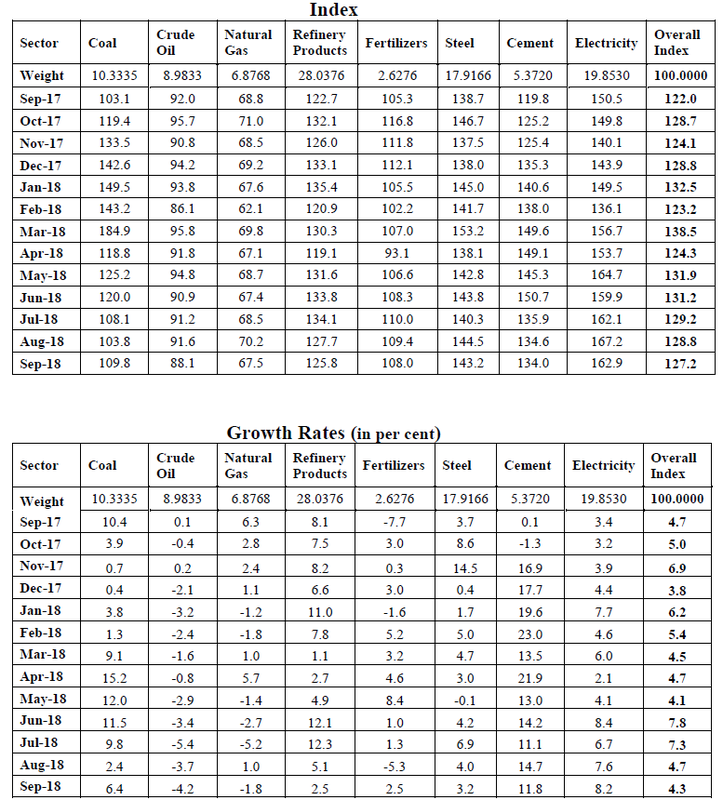 Its cumulative index increased by 14.4 per cent during April to September, 2018-19 over the corresponding period of previous year. Electricity generation (weight: 19.85 per cent) increased by 8.2 per cent in September, 2018 over September, 2017. Its cumulative index increased by 6.2 per cent during April to September, 2018-19 over the corresponding period of previous year. Note 1: Data for July, 2018, August, 2018 and September, 2018 are provisional. Note 4: Release of the index for October, 2018 will be on Friday, 30th November, 2018. Source: Data Released by Ministry of Commerce & Industry, Department of Industrial Policy & Promotion, Office of the Economic Adviser dated 31st October, 2018.